FirePhantom24's surprise request: she wanted to draw me a dragon (and I am just as impressed with hers!). I do like the wing-style as depicted in the Dragonriders series, but I like to experiment with different body types, colours and heads/snouts. I like my wize, happy dragons - but hey, even those ones need a snack now and then! I do actually like gryphons, as a rule, but that doesn't mean dragons don't eat em! I wuv widdle wabbits and gophers, too, but they get hunted by hawks and badgers, don't they! OvO;OH CRAP IM A GRYPHON!!!RUN!!!!!!! Wow! 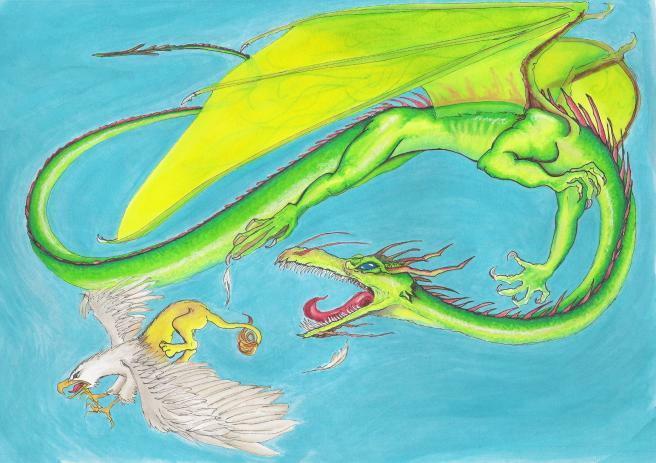 I like the green dragon...the griffon remindes me of the little mischievous griffon in my dream. Yup... Dragons do have fairly sizeable appetites, but I'm sure they prefer a challenging chase rather than just plucking cows from a farmer's pasture... You never know, smaller creatures sometimes have better manoeuvrability, so the gryphon may still be able to dodge him! Thank you for the nice comment, and thanks for visiting my gallery! Ah! Glad you like: and likewise, I saw the one you did for me! I love it! Thanks so much: I faved it!! I definately faved this one! The dragon's absolutely amazing, and his tail looks superb. The poor gryph though! ;) I have a soft spot for these creatures!